A failure to thoroughly regulate Canada’s oil sands is putting the country in a dangerous economic and environmental situation says the latest study released Thursday by the Canadian Centre for Policy Alternatives (CCPA) and the Polaris Institute. The report warns Canada is heading towards a "staples trap," whereby the more quickly bitumen is exported, the less diversified and productive the economy becomes. The study's authors also alert of a looming "carbon trap" in which the Canadian economy is so closely linked to carbon-producing industries that it becomes difficult to adopt measures to deal with climate change. A big danger facing the oil industry is shrinking markets for fossil fuels as a result of global efforts to address climate change, says the report. 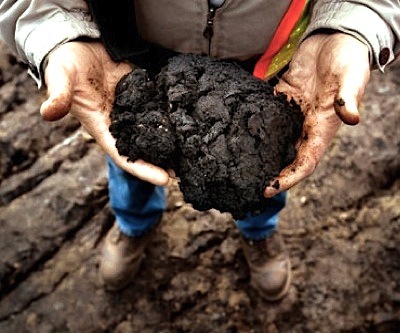 “Another consequence [of Canada’s current bitumen strategy] is an unbalanced and vulnerable boom-bust economy where production is increasingly concentrated in unprocessed products; where manufacturing and other tradeable industries contract; and where production and employment shift to non-tradeable industries, damaging Canada’s productivity and wellbeing,” says co-author Jim Stanford. Countries that depend too much on raw materials can fall into a dangerous cycle, he adds. "Staples-based economies must make enormous fixed-cost investments in production and transportation infrastructure, generally undertaken by large, often foreign-owned companies," the study says. The analysts recommend stricter guidelines and control of the oil sands to slow development, and transitioning to a low-carbon economy in which governments play a greater role than they now do. “Bitumen development poses critical challenges for Canada” was co-written by Tony Clarke, head of the left-leaning Polaris Institute; Diana Gibson, former research director of the Parkland Institute in Alberta; Jim Stanford, economist at Canadian Auto Workers, and Brendan Haley, a PhD candidate at Carleton University in Ottawa.